Having already used sage, chestnuts and pancetta to make my butternut squash risotto, I had leftovers of all those delightful Christmas ingredients, so the first sagey pasta is spaghetti with chestnuts, pancetta and sage (waste not, want not). The second pasta is rigatoni with sausage meatballs, fennel and sage. The fennel and sage combo is so wintery and warming, and the sausage meatballs so easy to throw together. Both pastas take less that 30 minutes to cook, so they are perfect pre-Christmas dinners when you’ve got piles of present wrapping, mince-pie eating and mulled-wine drinking to be getting on with. Using a heavy-bottomed frying pan, fry the pancetta cubes in a tablespoon of extra virgin olive oil over a medium heat, stirring frequently. When beginning to brown and crisp up, add the chopped onion and cook for a few minutes until softened. 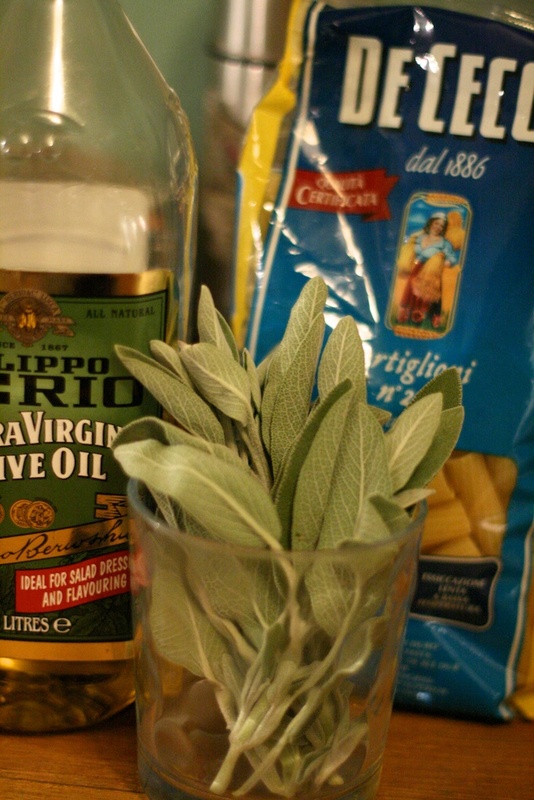 Add the garlic and a tablespoon or so of chopped sage. After a minute, stir in the chestnuts and turn off the heat. Set aside for a minute. Meanwhile, cook the spaghetti in a pot of boiling well-salted water according to the packet instructions. 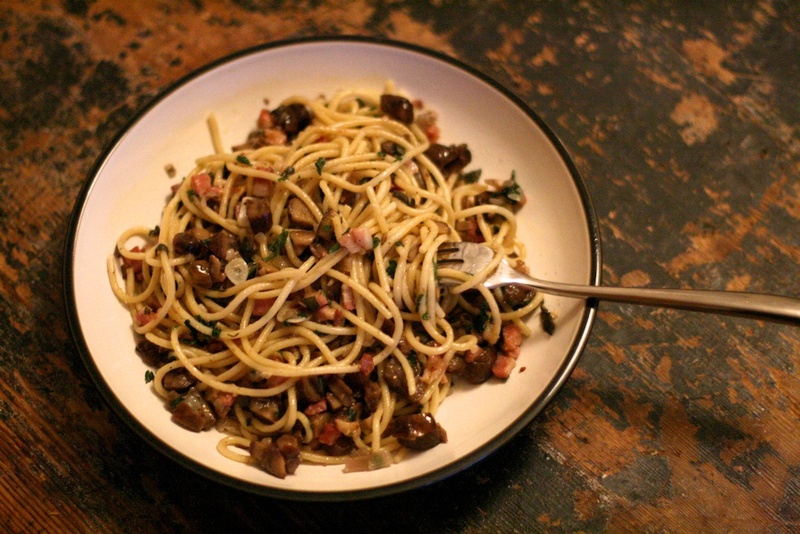 Reserve a couple of tablespoons of the pasta cooking water, then drain the pasta and add to the pancetta mixture. Add a tablespoon of the reserved cooking water along with the knob of butter and the grated parmesan. Over a medium heat, toss the spaghetti well with the mixture until all the pasta is well coated and silky (add a little more of the cooking water if necessary). Check the seasoning, adding salt and pepper to taste, then sprinkle over the parsley, the rest of the sage and some extra parmesan to serve. Heat the oil in a heavy-based saucepan over a low heat and cook the onion for 5 minutes until beginning to soften. Stir in the sliced garlic, half the chopped sage and fennel seeds and cook for a further minute. Split open the sausages, roll the sausage-meat into little meatballs and add to the onion and gently fry, until golden. Add the chopped tomatoes, purée and stock, and season well. Simmer for 10-15 minutes until thickened. Meanwhile, bring a large pan of salted water to the boil, cook the pasta according to the packet instructions, then drain (reserving some of the cooking water). Toss the pasta with the sausage sauce, the rest of the sage and the chopped parsley along with a tablespoon of the reserved pasta water. Sprinkle with the Parmesan and serve. Two lovely recipes, both great standbys for pre- and post-Christmas nights in. We all need a glut of carbs to soak up the plentiful and never ending supply of booze! 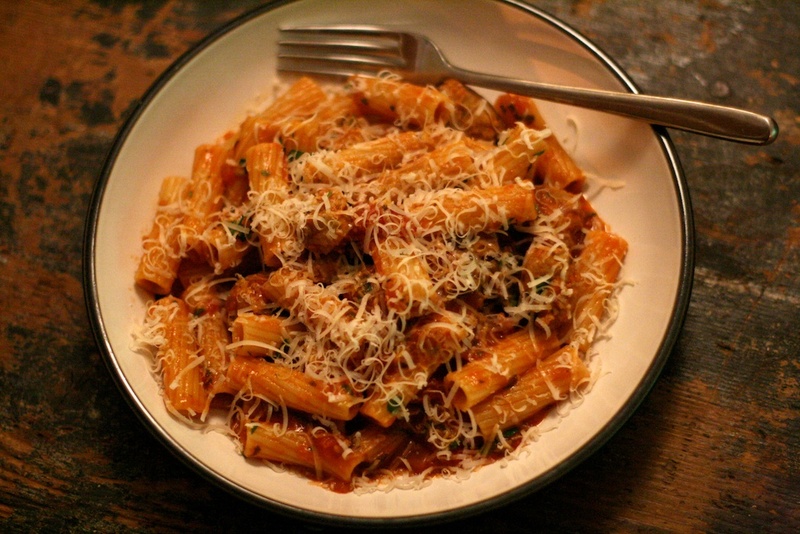 God I love rigatoni – perfect with meatballs too.